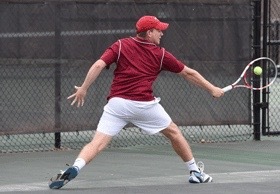 Loomis can boast one of the best boys varsity tennis teams in New England Prep School Tennis. The team has won the Class A Division of the New England Prep School Championship and the Southern New England tournament and has tied for first place in the Founders League several times. Loomis consistently places at the top of the New England Class A rankings, earning a berth to the prestigious Class A tournament. In 2018, the team finished the season with a 12-5 record and earned the opportunity to participate in the New England Prep Tennis Championship, as a team and as individuals. This is a particularly exciting time to be joining the program, as we recently completed a brand new tennis facility, featuring 12 beautiful courts. Our courts were awarded “Distinguished Outdoor Tennis Facility” by the American Sports Builders Association. Loomis competes in the Founders League, an excellent prep school tennis league, which consists of 10 private schools in Connecticut. The team’s schedule also includes other strong prep school tennis teams throughout New England. We pride ourselves on sportsmanship, work ethic and competition — we strive to be our best selves, on and off the court. In the final match of the season — and the final match of their Loomis careers for the team's six seniors — the boys tennis team hosted Kent, and every Pelican senior played and won. The boys varsity tennis team recorded an exciting 4-3 win at home over perennial powerhouse Hopkins School on Wednesday for the first time since the Hilltoppers were added to the Loomis schedule in 2007. The boys varsity tennis team took on Avon Old Farms on Saturday, April 14, and recorded its third win in four matches, defeating the Winged Beavers by a score of 6-1. Much like its first win of the season, the boys tennis team showed off its depth against Exeter on Saturday, earning points from the top to the bottom of its ladder and winning the team match 5-2.